Snow, freezing rain and fog have enveloped the Front Range of Colorado. 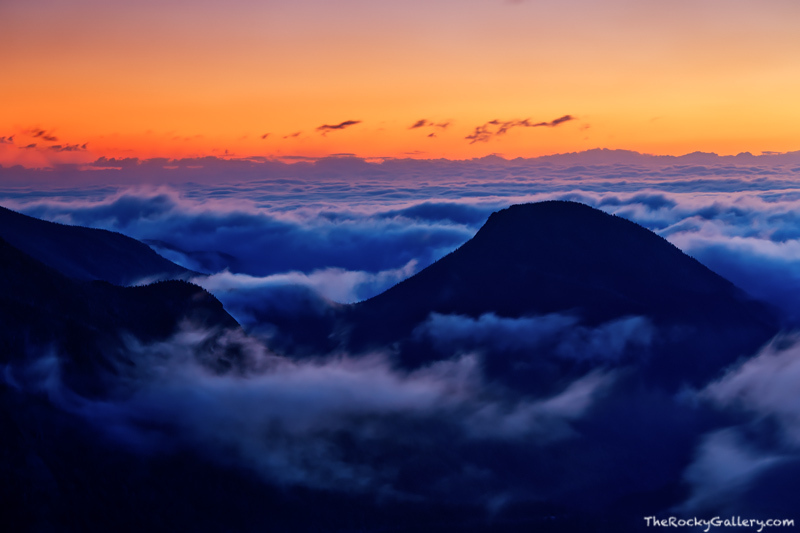 High above the inversion, McGregor Mountain peaks its head through the clouds just before sunrise. This particular morning was a spectacular morning to be on Trail Ridge Road. The snowline had not made it all the way up into Rocky Mountain National Park so Trail Ridge Road was still open to Rainbow Curve. The view from Rainbow Curve looking east towards the rising sun, and upslope weather pelting the lower elevations with snow was like being in an airplane 37,000 ft above Rocky Mountain National Park. Photo © copyright by Thomas Mangan.